Kodu is a 3D game building environment. If you have ever wondered how to make an Xbox type game, Kodu is a great place to start. Lets kids aged 6 to 10 create games on the PC and Xbox via a simple visual programming language. Kodu can be used to teach creativity, problem solving, storytelling, as well as programming. Anyone can use Kodu to make a game, young children as well as adults with no design or programming skills. The completed games are visually stunning and are completely created using the tools within Kodu. It is an entirely icon-based programming environment where rules are written and broken down into conditions and actions. All the coding icons use physical, real world concepts such as vision, hearing and time. Linking together code icons to form rules allow the user to define the behaviour of every object on the screen. The core of the Kodu project is the programming user interface. 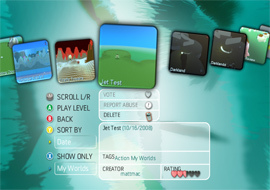 The interface allows user to select tools, build terrain and even program using only the mouse or Xbox controller. The language is simple and entirely icon-based. Programs are composed of pages, which are broken down into rules, which are further divided into conditions and actions. Conditions are evaluated simultaneously. Kodu tries to avoid boredom and frustration by letting new programmers do the fun stuff first — building a colorful 3D world, and adding characters and objects only takes minutes. Once the world is in place, the real work begins as students add programmatic behaviors to their world using a simple “if this, then that” visual language rather than writing actual code. Kodu not as original as a Scratch, but a good tool to teach the basics of programming. Kodu for the PC is available to download for free. Kodu for the Xbox is also available in the USA on the Xbox Marketplace, in the Indie Games channel for about $5.